When Thomas Paine wrote these words in 1791, he was writing in opposition to Edmund Burke’s defense of the aristocracy and the corrupt system that they had built for their own benefit. In a previous 100 years, the taxes imposed by the English government had increased almost tenfold (from 1.8 million pounds to 17 million pounds). By comparison, the budget of the U.S. government has increased to 14 times the U.S. budget of 100 years ago (after adjusting for inflation). Much like U.S. citizens of the 21st century, English citizens were oppressed by a government gone wild. The aristocrats were shielded from the taxes and regulations that were causing much grief among the lower classes. Like the English of the 18th century, has the national character of Americans changed such that we continue to believe the lies put forward by Progressives for the past 100 years? Dismally, it almost looks so. Many freedom loving Americans are confounded by the 2016 Presidential campaign. If the polls are to be believed, we are headed for one of most bizarre choices in the history of Presidential politics. How did we get here? It seems like far too many Americans have lost sight of some of the most fundamental aspects of liberty. We are being driven by personalities and policies, but lack the rudder of principle. Thomas Paine was a man of principle, who had suffered much by the end of his life because he refused to compromise those principles. Some of the choices offered to us for President this year seem to be lacking principle altogether. Can we survive? Yes! What is important is that the citizenry adhere to principles based on limited government, a free market, and individual rights. These are the principles that the Tea Party movement sprouted from. Do not worship those who fail to acknowledge the most basic principles of liberty, of the free market, and of our natural rights. What is the most important characteristic that you are looking for in our next President? Is it only that they beat the other team? Is it that they are the least offensive? Or, is it that your choice has the resolve to defend liberty? 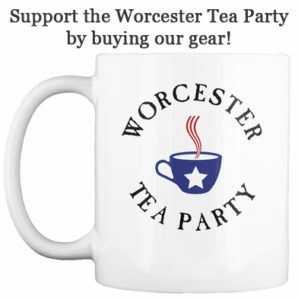 As an organization, the Worcester Tea Party does not endorse candidates, but we do ask that you consider their belief in our principles. Are they for limited government, Constitutional rights, and a free market? It’s a tall order, but you should not settle for less.